Bright & sunny home w/ South, East & West views of Chicago's incredible skyline. This Fordham 2 bedroom & 2 bath is 1,575sq ft of luxury living. From the spacious & open floor plan to the over-sized living and dining room space, the south-facing balcony conveniently located off the kitchen. Kitchen offers plenty of cabinet and counter space, plus counter seating at the breakfast bar, high-end appliances & more. Elegant custom Built-ins in the living room and guest bedroom offer plenty of space for your books, photos, & other collectibles. Dark hardwood floors, gas fireplaces in the living room, a master suite & so much more. An additional space available. Full-size storage cage included. 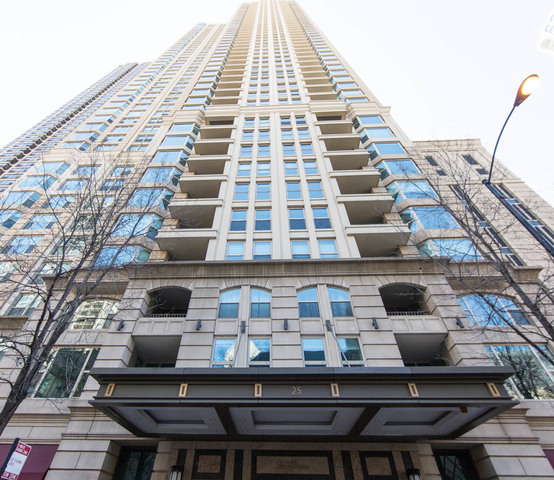 Full amenity building that offers: 24 hour door/maintenance staff, an indoor pool/sundeck, fitness center, a movie theatre, 2 party rooms, a wine cellar and more. Pets welcome. Parking additional $37,500. Directions One block south of Chicago Ave and one block east of State st.
Property information last modified by seller on Tuesday, April 16, 2019, 12:05 AM CDT. Information Deemed Reliable But Not Guaranteed. Unauthorized duplication, use, or linkage is prohibited. The information on this web site is for personal, non-commercial use and may not be used for any purpose other than to identify prospective properties consumers may be interested in purchasing. Monthly Payment Calculator results are for illustrative purposes only, not a financing opportunity; calculations assume a 30-year fixed-rate mortgage and do not include closing and other costs. Property Tax on NEW properties is estimated at 1.5% of Listing Price for payment calculation purposes; actual value may be higher or lower.